We’ve been crazy busy here at com.motion over the last few weeks. And now we can talk about why. 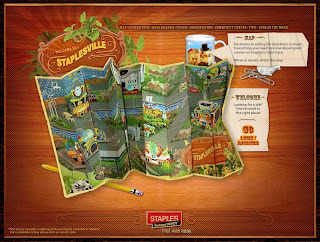 We’re helping STAPLES Business Depot to launch Staplesville.ca, an online recruiting Web site that is totally unlike any other. The launch is being supported by a social media release, a blogger relations campaign, a Facebook fan page and a YouTube video. "YouTube no place to discuss ideas"
What do you get when you take a land claims dispute, a politician, an iconic Canadian doughnut shop and mix in a little social media? An innovative if somewhat hokey YouTube video. Here’s one of a series of five videos released last week by Michael Bryant, Ontario’s minister for aboriginal affairs, to mark the two-year anniversary of the Six Nations dispute in Caledonia. YouTube is not the place to communicate either policy or to communicate government messages. To me, Howard’s comments show a complete lack of appreciation for the social media and the cultural revolution behind it. Joseph Brean, a fine reporter at the National Post, called me up to get my thoughts on the tactic and did to me what I did to hundreds of others in my years as a reporter — he boiled our ten minute talk into a dozen or so words. Fortunately, I got the chance to expand on my views in the latest Inside PR podcast, which will be released tomorow. After 100 episodes, co-hosts David Jones and Terry Fallis have turned the show into a round-table format and invited me, Julie Rusciolelli and Martin Waxman to join them. In episode 101 we discuss the thorny question of why PR people are somtimes seen as slimeballs and the Bryant YouTube video. When I covered the airline industry at the Globe and Mail, I got to write about some great characters, including Robert Milton, Clive Beddoe, Mark Hill, Michel Leblanc and Angus Kinnear. But that was nothing compared to the characters I encountered when I moved over to covering the advertising business. One of the biggest personalities in Canadian advertising is Geoffrey Roche, chief creative officer at Lowe Roche in Toronto. Check-out what happens in this video when Marg Delahunty confronts Geoffrey on behalf of OXFAM. Oxfam has produced similar videos with other personalities including Glen Hunt (the man behind Molson’s famous “My Name is Joe and I am Canadian” spot and Nancy Vonk (one of the creative directors behind the team that created the Dove Evolution spot.